My dad is a blustery British sailor who is always reminding me to think before I speak. To define our relationship would be impossible. The reason for this is most likely due to the lack of meaningful words exchanged between the two of us. One has to wonder, if the words are not exchanged how can you really know how the other feels, my answer to this is history. The history I share with my father is more unique and with more volumes then I have shared with anyone else in my life. Each moment as a child spent with him was a lesson to be learned and each lesson reflected how he cared about me. There are many chapters I could write on the lessons I have learned from my father, and a lot of them took place on our boat. My father has always been a true adventurer. He and my mother moved to the United States from England in 1970 with a job offer from Boeing and hopes of living somewhere with less precipitation than the dreary weather of Halifax. The early years were held together on shoe string budgets, coats from the Wigwam, and furniture purchased from garage sales, the eight-foot green couch being my favorite. But none of that mattered to my father, because here in the states there was the promise of the American dream. Part of the American dream for my father was to own a boat. After several years of saving, which included some really bad home hair cuts and too many sloppy joe dinners, my father purchased a Rawson 30ft. Our adventures on the boat started small, like getting the toilet to work and clearing the thick layer of green sludge from the bottom of the boat. Next, we spent a few sunny days bobbing around outside the Des Moines Marina. After some practice sailing and after reading a few literary greats like Shakleton. Dad was ready to take the family on an overnighter. “To an Island, Blake Island, it will take about three hours,” my mother said. Three hours? We could fly to Disneyland in three hours. Three hours on a 30-foot boat can seem like a whole year to an eight-year-old and my older sister and I would soon learn that traditional games of amusement did not always amuse. Entertaining ourselves became an enormous challenge. Our first hope was a simple game of hide-n-seek. Where does one hide in a boat? In those small storage compartments, of course. The cubby holds in the forward cabin, below the bunks, looked like and ideal hiding place to me. I struggled to climb inside one then pushed the sleeping bags in front of me to conceal my secret spot. It took my sister two minutes to find me, it took much longer to get me out. I was stuck. The floods of tears triggered by blatant fear that I would never get out of the world’s worst hiding spot caught parental attention. My sister yelled for Mom, Mom hollered for Dad. With some pain suffered by my right ear during my extraction father saved me from my hiding spot. He hugged me quickly, then pushed me away. “Never climb into a hole you can’t get out of,” he said. A wise lesson to be learned. We stared at him blankly as water dripped from his rain slicker and he struggled to steady himself from the crashing waves against the hull. “Put your rain slickers on and get up here, both of you,” he said while pointing his index finger to the wet deck with authority. With life jackets and slickers on we held tight to the side rail and slowly worked our way to the bow of the boat where our father stood holding court. “Now, lay down on your stomach,” he yelled. “What?” my sister managed to mouth. “You heard me, like this,” he said. He laid flat on his belly across the bow with his head hanging over the side. We followed his lead like all good daughters do when their father tells them to do something, no matter how crazy it seems. I remember looking at my mom who stood concerned at the helm but was not going to come to our rescue. “Now pull yourself to the edge so you are looking right down into the water,” he said. I laid down, grasped onto the metal rail, and slid on my belly toward the edge. The boat rose and crashed back down into the sea. Water rushed up into my face. Salty water ran down my cheeks and soaked my hair. I turned and smiled at my dad, he beamed back at me. I thought to myself, this is much better than hide-n-seek, this is great! That year we hit what seemed like every island and harbor in the Puget Sound. The next year we set sail for the San Juan’s. The following year we went all the way to Desolation Sound. My sister and I would stroll down the candy aisle, carefully making our sweet selection with the small amount of money we had been allotted. I would have to squat down to see the lower shelf. My life jacket restricted me at mid-section from bending over. That life jacket drove me crazy and it didn’t take too long to realize we were the only kids on dry land with life jackets on. I felt like one of those dorky kids that puts on his blow up arm floaters and goggles in the car to be driven to swim practice. “Dad, do we always have to keep our life jackets on?” I protested. “We are not going to drown in the store”. “Yes, young ladies, you will keep your jacket on because you run up the dock and to the store so quickly you never know when you are going to run into trouble or the water for that matter. You should always be prepared,” he replied. On my father’s good advice I finished high school and graduated from college. My father became quite good at pursuing the American dream and after trading his boat in several times for a new model he finally purchased a Beneteau F45 which he proudly named Farrari (later to be coined by crew members “how far-are-we?). It was then he decided he was ready for a grand sailing adventure. He signed up to race from Victoria, B.C., across the Pacific Ocean, to Maui. I flew to the Hawaiian harbor of Lahina when he completed the race to reintroduce him to land and real food after thirteen days at sea. He looked tired, not any thinner, and really happy. Once Farrari was tied to the dock, our small welcoming committee and the boat crew members jumped into the water. We bobbed happily in the warm, clear Hawaiian water and drank champagne, as floral leis floated around our necks. As I stared up at the wonderful sun I thought, even at his age, my father is still an adventurer. Any age is a good age to take on a new challenge. 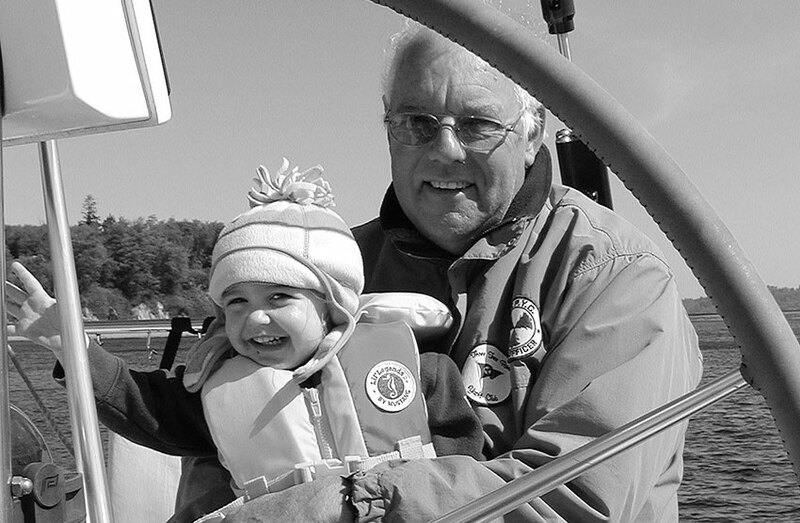 Photo shows Bill Walton, the author’s father, with new sailor, granddaughter Hannah.